Osaka commuters on their way to the Kansai Train Line jump into a Bokugo, a small air raid shelter designed for up to ten people, during a civil defense drill. The Japanese public was instructed to use these shelters with their faces covered and their backs to the open. However, in practice these shelters did not allow for much comfort during sustained bombing efforts. The British Anderson shelter allowed for a family of six to sit up, to store some food, and even for some movement if possible. It was possible to have sanitary facilities, if cramped and without privacy. The Japanese public Bokugo allowed for no movement, and no facility for sanitary needs. the Japanese government did not prepare the populace for sustained raids that lasted hours, and the preferred huddled position limited the occupants' view, exposing them to hazards such as falling buildings, fire, and close proximity to nearby bomb hits. Sitting in the position for hours left people drained and unable to run from advancing fires. 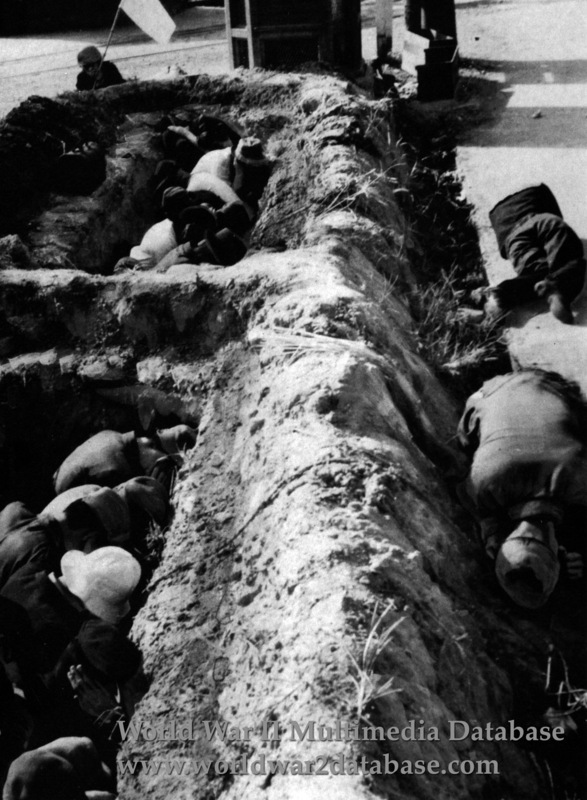 Often after a raid recovery workers would find Bokugo stacked with bodies.